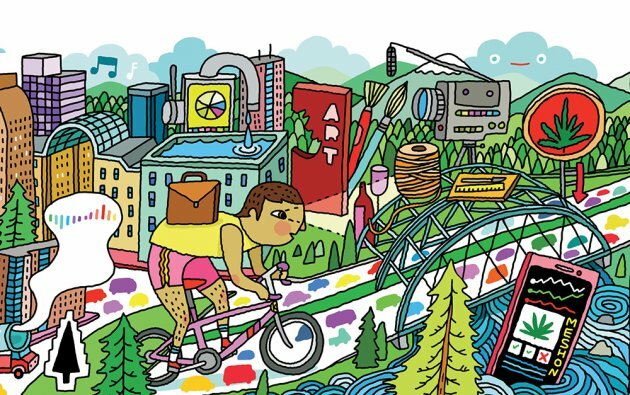 I wrote an insider's guide to Denver's start-up scene for the March/April issue of Inc. See here for the online version. Many are drawn to Denver--Inc.'s No. 8 Surge City--for its laid-back, weed-friendly culture, which certainly doesn't stop with its plethora of cannabis startups. Here's everything you need to know about the city's entrepreneurial scene, from which investors to meet with to where to do Bend and Blaze yoga. Entrepreneurs and investors take meetings at Denver Central Market, a warehouse-turned-gourmet food hall in the heart of the River North (RiNo) district, which flaunts a creamery, a butcher, a bakery, a fish­monger, and a wood-fired pizzeria. "It's slammed," says Tom Higley of early-stage accelerator 10.10.10, "but you can always find a seat." The Commons on Champa, formed by a public-private partnership four years ago, is a hub for early-stage startups that provides free co-working space, with the option to rent out conference rooms and event space. Cultivated Synergy is where cannapreneurs congregate. This lively co-working space in the RiNo district has communal work­spaces, five private offices--occupants include a concentrates company and a payroll firm--and Bend and Blaze yoga. At night, it transforms into an event venue where even non­members can attend everything from beer tastings and bat mitzvahs to budtender-appreciation parties. Tech execs and employees tend to work and live in bustling LoDo (Lower Downtown), given its proximity to co-working spaces CTRL Collective and two WeWorks, Facebook and Slack outposts, the commuter rail to the airport--and Kimbal Musk's restaurant, the Kitchen. The RiNo Art District, formerly a manufacturing neighborhood, is home to design studios, architecture firms, art galleries, and startups, like online interior-design marketplace Havenly. CBD (no, not that--the Central Business District) was once a neighborhood just for finance and energy stalwarts. Today, startups including Geospiza, Nanno, and Salt have colonized the area. Average cost per square foot of office space for the Denver metro area. Number of co-working spaces in central Denver. cannabis dispensaries and 272 indoor-grow locations reside in Denver. The city has yet to see a unicorn. "We'll get seed and Series A funding, but then usually have to raise capital from the coasts," says Paul Foley, managing director at SmartCapital. When it comes to VC capital, Foley estimates that New York City gets 20 percent, Northern California gets 40 percent, and Denver gets a meager 0.6 percent. "So companies here exit earlier," he says. "You get faster, smaller exits." Chris Onan, a co-founder of Galvanize, a Denver-based national coding school, is a strategy consultant-turned-venture capitalist who has invested in more than 200 companies. Onan can typically be found linking startups in the Denver-Boulder tech scene with talent or capital. "He's a super­connector," says Erik Mitisek, co-founder of Denver Startup Week. "He's our VC prince of the city." Jenna Walker was a professional photographer before co-founding online photo book Artifact Uprising. She sold her Denver-based company to VSCO in 2014, and recently became entrepreneur-in-residence of Techstars Sustainability in Partnership with the Nature Conservancy, which backs 10 entrepreneurs per year, like those behind Node, a Seattle-based company that makes eco prefab homes. Erik Mitisek, the chief innovation officer for Colorado governor John Hickenlooper and former CEO of the Colorado Technology Association, is indispensable when it comes to startups in this town. He co-founded Denver Startup Week, launched the Commons on Champa and the online booking agent Next Great Place, and is now president of financial software company IMAgine Analytics. Jaclyn Fu and Lia Winograd launched Pepper, maker of bras for small-chested women, in 2017. "Most bra companies design for a single standard size: 36C," and then scale it up or down, says Fu. Pepper fixes the "cup gap." If you're still searching for your ideal cannabis, order a genetic test from Green Genomix. The early-stage company, founded by Jackson Rowland, will send a DNA collection kit to analyze genetics like CB1 receptors, and then provide a report revealing which strain, consumption method, and ratio of CBD to THC is best for you. Amy Baglan was on OkCupid and Match, but "it was such a sad experience," she says. An avid yogi with a regular meditation practice, in 2015 she launched MeetMindful, a dating app for the mindful-living crowd. Founded by Bryan Leach in 2012, Ibotta makes a shopping app that allows people to earn cash back on everyday purchases. It's one of the largest consumer tech companies in Denver, with 500 employees. University of Denver's Project X-ITE runs an entrepreneurship workshop series, an incubator, and an accelerator that has produced startups including Boobi Butter, which makes breast-care products and encourages women to get regular breast exams. Accelerator and venture fund Canopy­Boulder has invested in a slew of cannabis-related companies, including digital signage outfit GreenScreens and Würk, a payroll company. Early-stage accelerator 10.10.10 invites 10 successful serial entrepreneurs to Denver to solve one of 10 "wicked problems" in 10 days. Graduates include Spout, maker of a device that can be used with a smartphone to analyze the levels of lead and other contaminants in a drop of water. Welltok, a health care software company, raised $75 million in 2018, bringing its total funding to a reported $251.7 million. CyberGRX, a cyber-risk platform company, raised $30 million in 2018. Galvanize, one of the largest coding schools in the United States, raised $32 million in 2018­--bringing its total funding to more than $167 million--and then acquired San Francisco-based Hack Reactor.